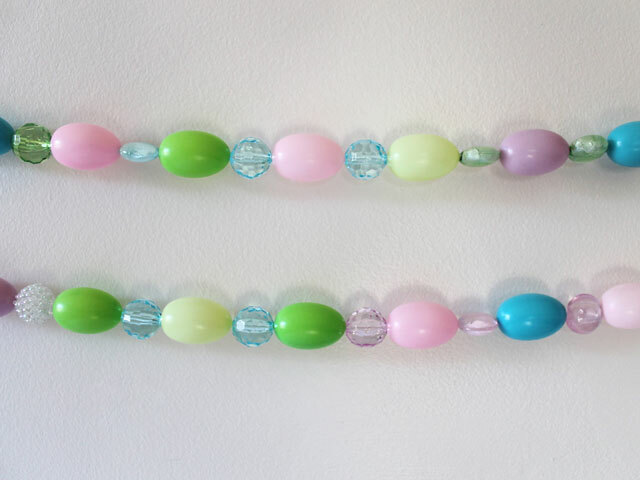 Here are some Easter decorations that I made with the beads I mentioned buying in my previous post, here. 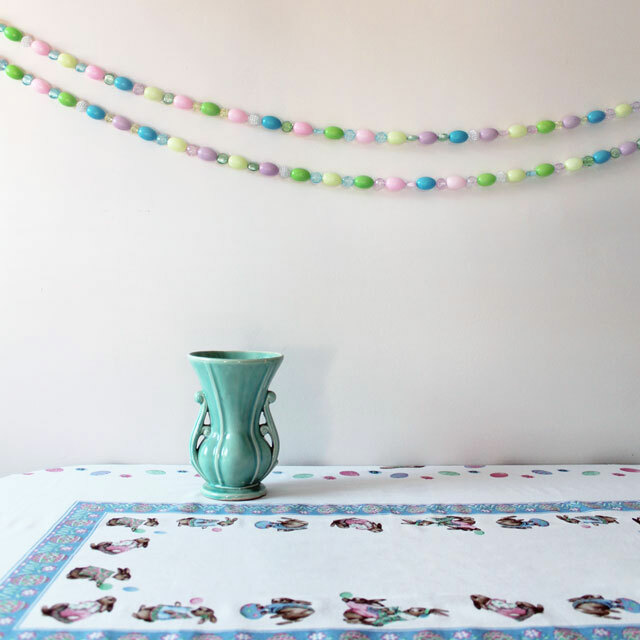 I began by making a couple of garlands to hang on what has become our 'garland wall', over the kitchen table (see that spot dressed for spring, autumn, Christmas, a birthday and a themed dinner). 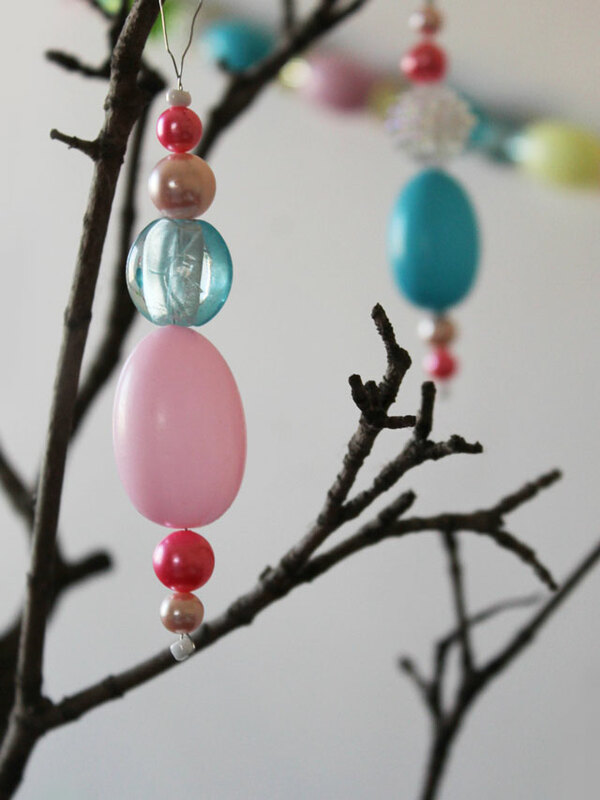 I ended up with some beads and plastic eggs left over after making the garlands, so I added some vintage beads from a broken necklace to make some hanging ornaments, as well. Each is about 6 feet long, with an extra foot of string at each end to tie it up. 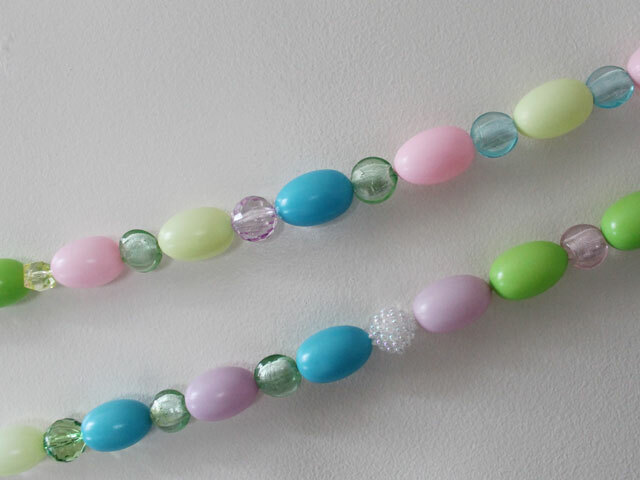 Supplies - (1) A variety of beads, ranging in size from 1/2 an inch to 3/4 of an inch, with holes that are large enough to pass a large sized sewing needle, threaded with embroidery floss. 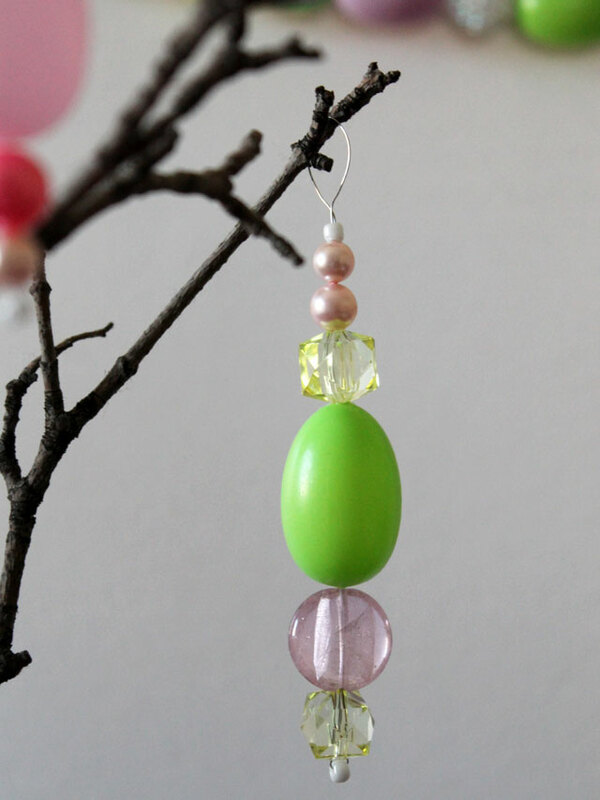 When choosing your beads consider the weight and cost (since you'll be using quite a few). I got 95 beads at Arton Beads for $15. Most of them are plastic, but I also included some glass ones because they were having a sale on them making them affordable for this project. 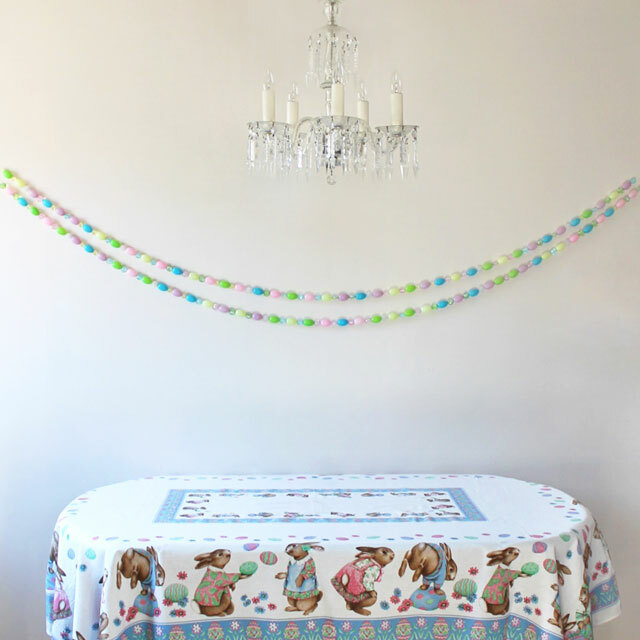 (3) Some embroidery thread long enough for the garland with an extra foot at each end to tie. 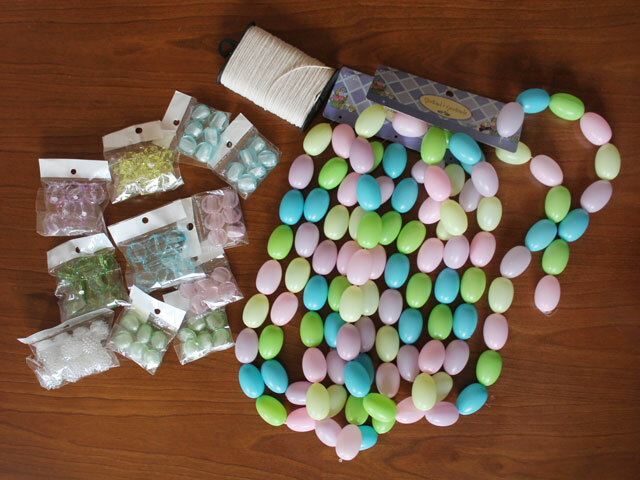 Note that my picture of the supplies shows regular string, but that ended up being too thick to go through the beads when threaded on a needle, which you need to use in order to get the plastic eggs on, so I switched to embroidery floss, which worked perfectly. 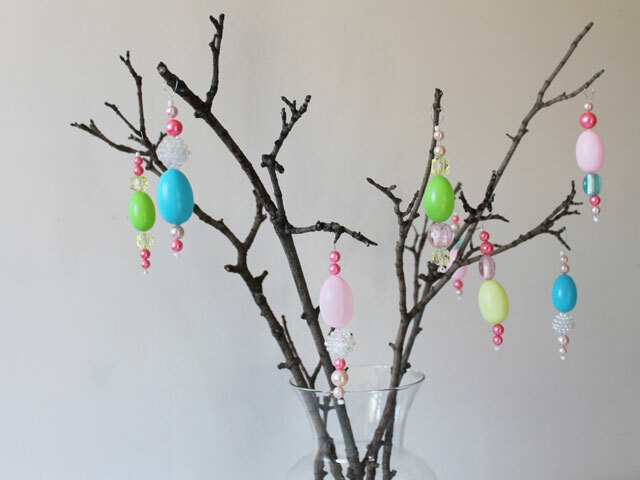 (4) A large sewing needle, long enough to pass through the plastic eggs. These are also known as darning needles. 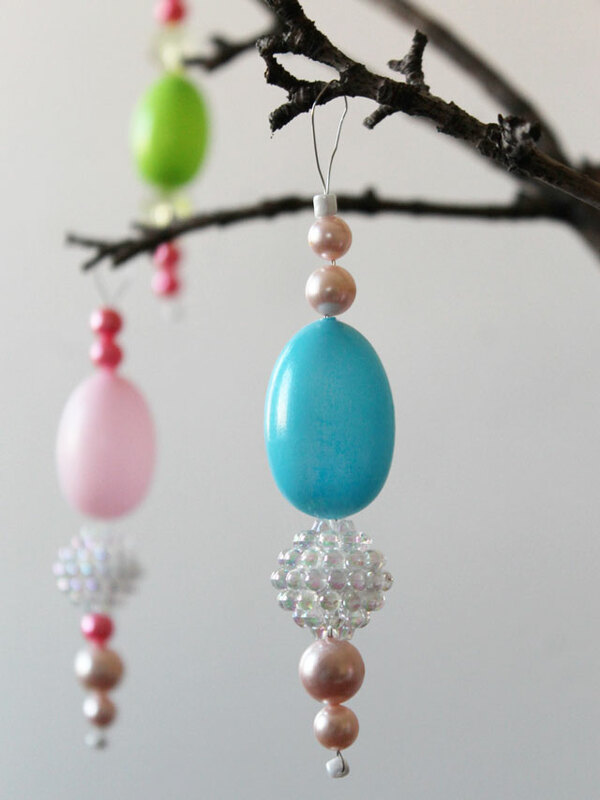 (5) A pair of pliers is handy to have to help pull the needle through the eggs. 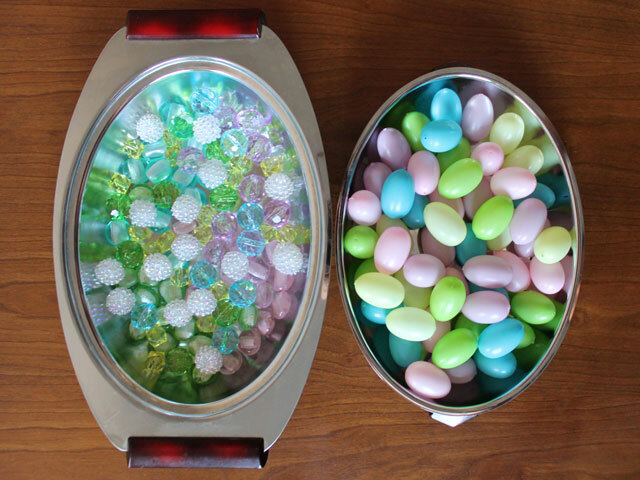 Then you just string you beads and plastic eggs on in a pattern you like. 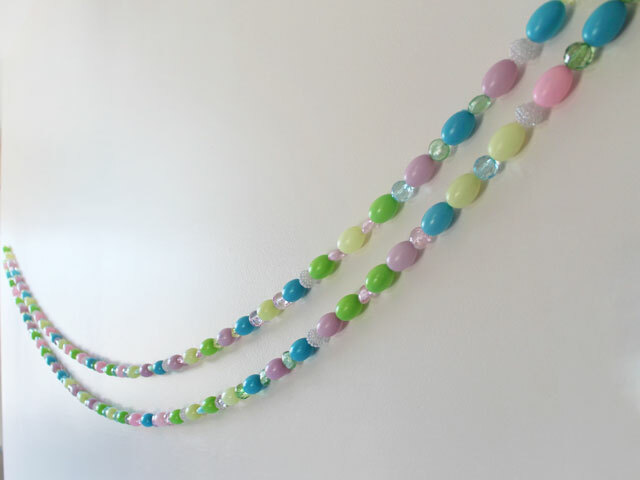 Since my garlands were going to be pretty long, I began in the middle and worked towards one end, and then switched the needle to the other side and worked from the middle the other way. 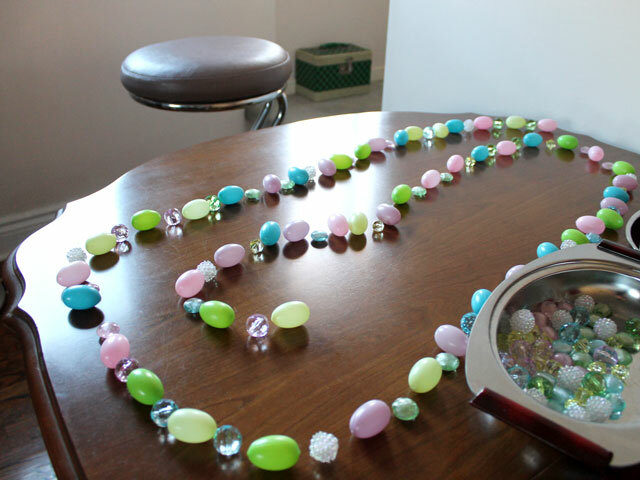 Also, I laid the pattern out on the table first, so I could then just mindlessly thread the beads and eggs on. 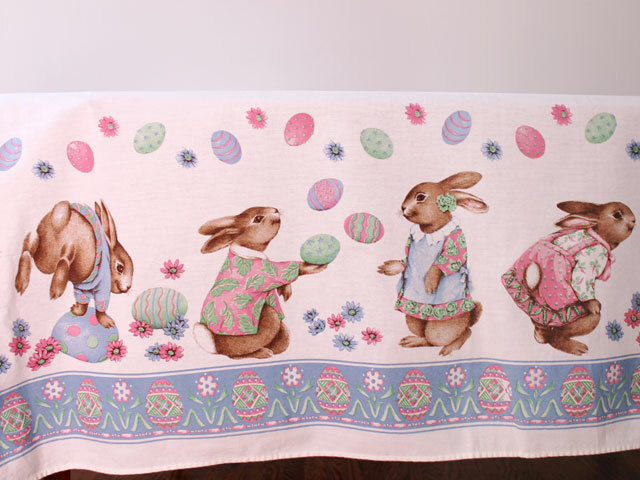 Here's a close up of the cute vintage tablecloth I found on ebay a few years ago. On a lark I had bid the minimum bid of $9.99 and then surprisingly won the auction. Supplies as above, except switch some thin wire for the embroidery floss, and add some other smaller beads to the mix. I had some from a vintage necklace that broke. 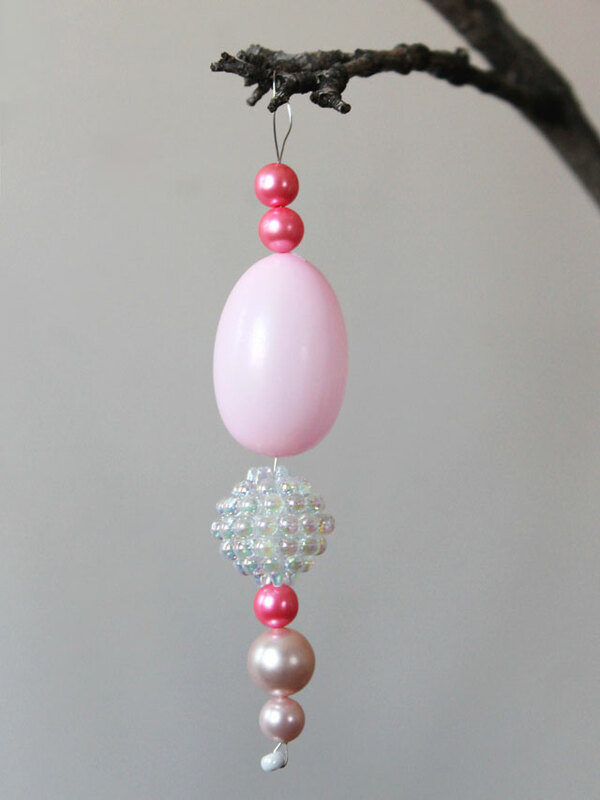 Also, you'll need at least one seed bead per ornament. Cut pieces of wire about 7 1/2 inches long. 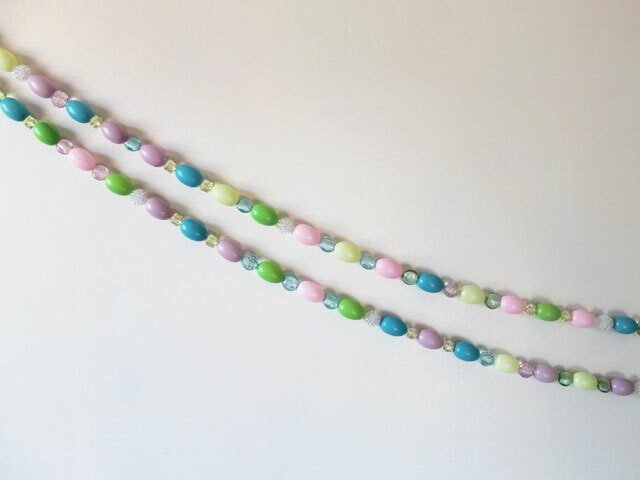 Begin by attaching a seed bead, by threading it on and bending the wire up about 1 1/2 inches, and twisting to secure it. 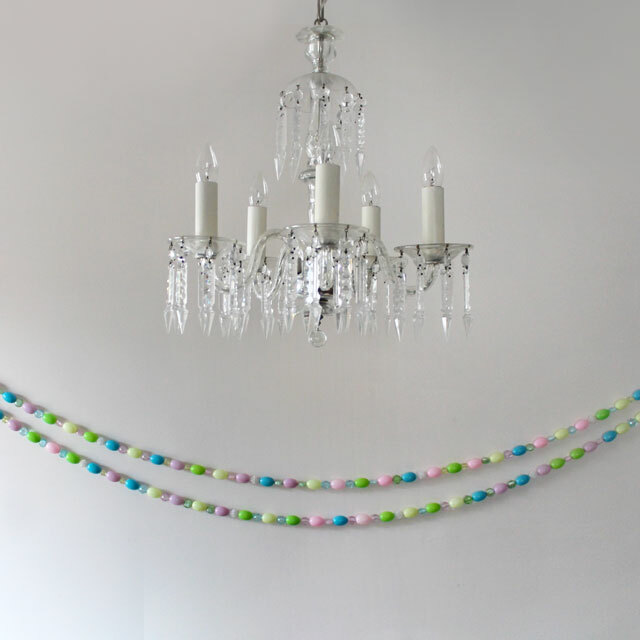 Then thread your beads and plastic eggs on from the top (the few on the bottom will end up covering the end of the wire that you bent up). 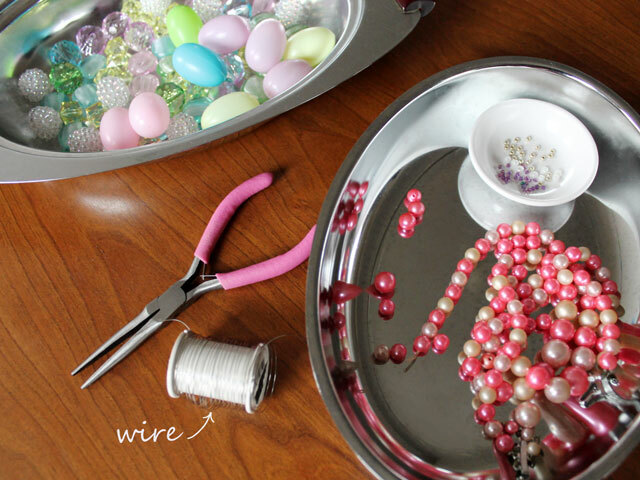 To finish, make a loop by bending the wire down and passing it back down through the threaded beads (your pliers come in handy for that part), and give the loops a twist to secure them. so pretty! 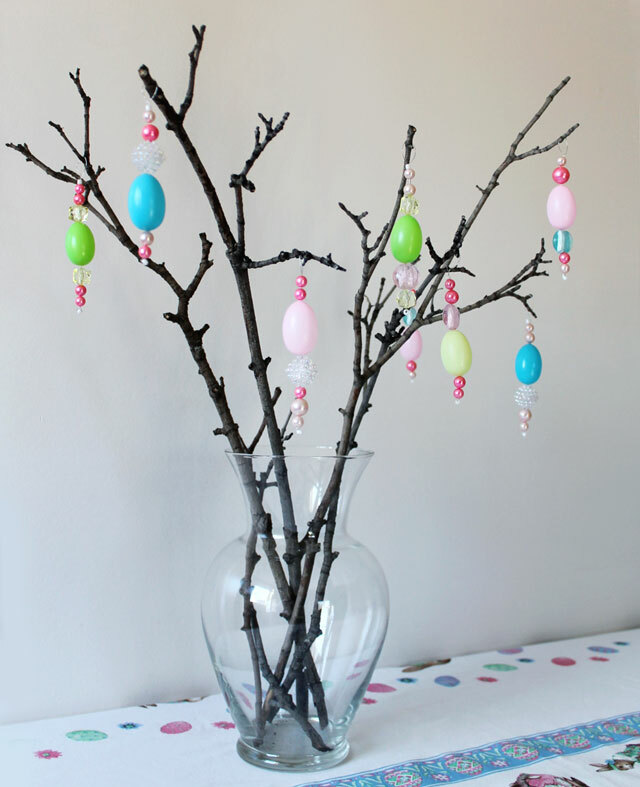 I love the garland, but the egg ornaments are my fave. very lovely.